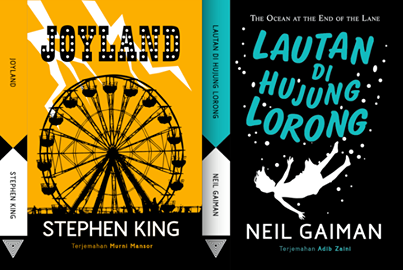 Just this month, Fixi published the first Malay translations of a Stephen King novel, JOYLAND, and a Neil Gaiman novel, THE OCEAN AT THE END OF THE LANE (translated as LAUTAN DI HUJUNG LORONG). Why do you think it’s taken so long for these bestselling authors to be translated into Malay? I know; it’s unbelievable! The difficulty, we found, has been finding English-to-Malay translators with the talent and the stamina to take on novel-length projects. Stephen King’s JOYLAND was especially tricky: the dialogue uses a lot of slang words, and pinning down his exact meaning in Malay isn’t easy. It took about five months to prepare JOYLAND in translation. Neil Gaiman’s THE OCEAN AT THE END OF THE LANE is a shorter novel, it took us about three months. How do you decide which bestsellers to translate? I’m drawn to authors I’ve read myself, authors I love. I’ve been reading Stephen King since I was 15 years old, and I got to know Neil Gaiman a little later, from reading comics like the Sandman series. So I grew up knowing both these authors. I think one of the functions of a publisher is to diversify the range of books available to readers. Fixi publishes quite a few Malay-language thrillers, and I wanted to do something different, I wanted to try something new—capture the attention of a new readership with these novels. So far, Fixi has focused on genre novels—why is that? When I began Fixi Books I wanted to publish pulp fiction because it’s so addictive, honestly. I used to collect crime novels by Jim Thompson, the Black Lizard editions, and I was first drawn to them because of their cover art—they were such eye-catching covers. So I was inspired by noir in the beginning. And then Fixi started publishing crime novels in Malay, many of them about psycho killers (laughs). Fixi publishes science fiction, too—like GERGASI [GIANT] by Khairul Nizam Khairani, which is about a robot who helps Malay warriors fight off the Portuguese in Malacca in 1511, and then the story jumps forward into the future, when China is the world’s superpower. But sci-fi isn’t as popular in Malaysia as other genres; Malaysians like sci-fi movies but not so much sci-fi novels. Our most popular genre novels are romances, love stories. So I started Fixi to offer a different range of genre fiction. What about Malay-language titles—what kinds of novels have proven to be bestsellers for Fixi Books? KELABU [Gray] by Nadia Khan is a love story, but it’s also concerned with issues of gender and sexuality, issues that might not be found in the kinds of romances that are popular here. We’ve gotten into trouble with some bookstores because some other novels use crude language—some bookstores are reluctant to stock them—but at the same time, these stores are promoting FIFTY SHADES OF GRAY, so… [laughs]. Another bestseller for us is ASRAMA [Hostel] by Muhammad Fatrim, a ghost story. We’ve sold over 10,000 copies of each title. Can you tell us about Malay-language books you plan to publish in English? We’ve got a non-fiction title we’re translating from Malay into English. It’s called WHY MALAYSIA HAS NEVER REACHED THE WORLD CUP [CERITA MALAYSIA TIDAK KE PIALA DUNIA] by Lucius Maximus (DuBook Press), and it’s the story of Malaysia’s repeated attempts—and our failure so far—to even qualify for the World Cup. The Malay version was published two years ago. Why translate CERITA MALAYSIA TIDAK KE PIALA DUNIA into English? To cash in on the World Cup season. I am not a football fan but I am interested in the World Cup, for some reason. Fixi also has a novel inspired by the coming World Cup or at least Brazil; we have sponsored a Malaysian writer to spend the whole month there to write a novel about it. Are there any challenges in finding Malay-to-English translators? For this book in particular, we wanted someone who could capture the chatty but sardonic tone of the original and we found someone. Fiction might be more difficult; we might start by translating a few of our short stories rather than novels. This interview was initially conducted in Malay and translated to English by Nicole Idar. Find the Malay-language version at the Dewan Sastera blog here.